Happy birthday to me. Happy birthday to me. Happy birthday to me… Happy birthday to me! Hey, guys. It’s my birthday and I made myself a cake, ’cause that’s how I do. The wait is over – let’s make cake! This cake is simple, requiring just 1 bowl to make! Plus, it requires basic ingredients you likely have on hand right now. The recipe is adapted from my Vegan GF Carrot Apple Muffins, but it needed some tweaking to get that cake-like texture. I tested this recipe for 3 days straight (oy) until I finally ended up with this perfected version. I served it to friends (non-vegan and non-gluten-free folks) and none of them could tell that it was special-diet friendly. Score! The base of the cake is coconut oil, applesauce, flax eggs, maple syrup, and almond milk. Organic brown sugar and cane sugar add the perfect amount of sweetness while leaving the cake light and fluffy. And for gluten-free flours, I went with almond flour and my go-to gluten-free blend. 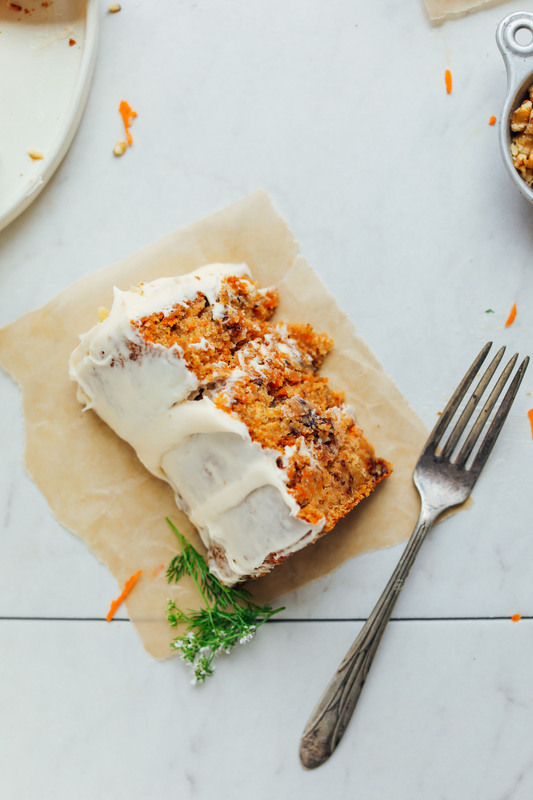 The result is a light, airy, fluffy carrot cake that retains its moisture without being mushy (the ultimate goal). Once cooled, it’s frosting time! For frostings, I included several options. After taking a vote on Twitter, it seemed many of you wanted to see both a vegan buttercream and a cashew buttercream. But guess what? I provide 6 frosting options below! For my cake, I went for classic Vegan Cream Cheese Frosting – I couldn’t resist. But really, any of the options would be amazing! Just depends on how creative and healthy you want to be. This would make the perfect birthday cake or cake for summer celebrations, wedding showers, cookouts, and beyond! It’s insanely flavorful, rich, moist, and undetectably vegan and gluten-free. Those who are gluten-free will be happy to know there isn’t any oat flour in this cake. I also included nut-free, oil-free, and refined-sugar-free options in the notes. If you’re into cake (who’s not? ), be sure to check out our other cakes: Vegan Birthday Cake, The Best Vegan Gluten-Free Chocolate Cupcakes, Vegan Chocolate Hazelnut Cake, Vegan Funfetti Cupcakes, Vegan Pumpkin Cake, Vegan Pumpkin Roll, Vegan Apple Gingerbread Cake, and Gluten-Free Zucchini Cake! Preheat oven to 350 degrees F (176 C). Butter and flour two 8-inch, 1 9x13-inch, or 3 6-inch round pans with coconut oil or vegan cooking spray and dust with gluten-free flour (adjust number/size of pans if altering batch size). Shake out excess. Set aside. *If avoiding oil, sub extra applesauce. The cake may not be quite as moist and may not bake up as nicely, however, so proceed with caution. *I used brown and cane sugars because they provided the best texture (fluffy and tender) for the cake. I also tested with coconut sugar, and although it was sweet enough, the texture was more dense. But, if coconut sugar is preferred, it still turns out well! *If almond/nut-free, sub the almond milk for rice, hemp, or light coconut milk. And sub the almond flour for another nut/seed flour (such as hazelnut, sunflower seed, or brazil nut). If you can't tolerate nuts or seeds, try subbing more gluten-free flour blend or oat flour. And omit the walnuts or sub raisins. *I used my go-to gluten-free flour blend. If subbing your own blend, know that the results may vary. *Recipe adapted from my Vegan Carrot Apple Muffins. Hi! Thank you for the recipe. My family – most importantly my son for whom I made it – loved this cake. GREAT flavor. I used coconut sugar instead of the white sugar. I didn’t have any almond flour, so I did 1 1/2 cup of Bob’s Red Mill AP GF flour blend and then 1/3 cup of coconut flour (since it absorbs so much liquid). It turned out well. I might even try a little less coconut flour or a little more applesauce next time to ensure it doesn’t dry out. For icing, I used Kite Hill cream cheese, powdered sugar and vanilla and it turned out perfect. So glad you and your family enjoyed this recipe! Thanks for sharing your modifications! I made this cake for my husband as he loves carrot cake but I am gluten intolerant and he is allergic to eggs. It turned out SO well. It’s moist + delicious and fluffy! Paired it with your vegan cream cheese icing and he is raving about it! I definitely recommend making the flour blend, as I’ve had a lot of recipes in the past not work because of my flour choice. Thank you so much for all the awesome recipes you post, they always work out for us and are so delicious! I just made it for Easter . It was delicious ! I used regular flour instead gluten free and turned out great ! I made this carrot cake for Easter and it was outstanding. I followed the recipe with only the following changes – I used King Arthur’s Gluten Free Flour instead of making my own blend and I omitted the walnuts. I made the 3 six inch cakes and baked for 40 minutes. I cooled it completely and wrapped and stored it at room temp until the next day when I frosted it and served it up. I made my own cream cheese frosting -1 stick of vegan butter, 4 oz (1/2 tub) of Myokos cream cheese, 2 cups of powdered sugar, 2 tsp . vanilla extract. Everyone raved about the cake with several non-vegan family members fighting for the last of it. Seriously – make this cake!!! Thank you, Dana, for another fantastic recipe!! So glad to hear it! Thanks so much for sharing your modifications! So glad to hear it, Jakini! Thanks for sharing! I made this and although the flavor was good, it looked nothing like the picture above. It was a very heavy cake, more like a bar. Not impressed at all and I followed the recipe exactly. Clearly the picture above is not the recipe listed. Hi Nan, sorry to hear this didn’t turn out as expected! It sounds like something definitely went wrong! What type of gluten-free flour blend did you use? Is it possible that it contained coconut flour or some sort of other dense flour that would cause it to be heavy? We haven’t had this problem! Can I sub one egg per flax egg? Hello, I’m wondering if I can just substitute 3 eggs for the 3 flax eggs? Or should I do more or less? I saw it varies per recipe so I’m wondering if you did any tests for this specific cake. Thanks! I just saw that someone else already asked this! Never mind! Thanks! Love your recipes and can’t wait to try this one! Is it possible to use store bought egg replacer instead of flax eggs? Thanks! Hi Alexandra, We haven’t tried that, but other readers have done so with success. Hope that helps! I’d love to use a loaf pan for this. Could it work? Hi Alyssa, we haven’t tried it, but that might work! Another reader tried it and ended up with it being too dry so uou may have to play around with the cooking time. Hope that helps! However I can’t have flaxseed! What would you suggest instead? Hi Kitty, if you can have chicken eggs, you can sub 1 small chicken egg per 1 flax egg. Hope that helps! Can you sub something else for the flax eggs? I’m allergic to flax and it’s not an option for me. Also, how would regular flour hold up with the almond flour? Hoping to make this Sunday for Easter. Hi Katherine, if you can have chicken eggs, you can use 1 small chicken egg per 1 flax egg. Other readers have had success using regular flour in place of GF. Hope that helps! I can’t do any gluten, rice, corn, or oats. Could I sub coconut flour or quinoa flour for the gluten free flour? Hi Rebecca, hmm, that’s tricky! We would say quinoa flour would be the better of those two options since coconut flour absorbs so much more moisture. But we haven’t tried it and can’t guarantee results. If you give it a try, we would love to hear how it goes! Do you think this recipe would work to make cupcakes? Hi Michelle, that could work! We would recommend using our carrot muffins recipe as a guide for baking. Hope that helps! I would like to include eggs in the recipe, what is the best way to do that? Would I need to omit anything? Would flax eggs still be necessary? Hi Mackenzie, You can sub 3 eggs and omit the flax eggs. Hope that helps! Yes, that should work! If doing that, use the full amount of almond milk called for. Hope that helps! Could I make the these into cupcakes? Will it change anything? I assume bake time will be different for sure but is that the only thing to be aware of? Hi Alix, that could work! 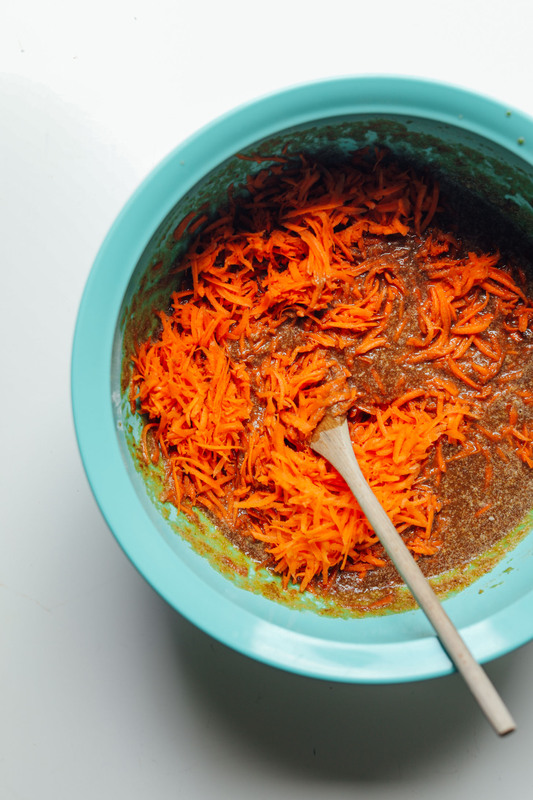 We would recommend using our carrot muffins recipe as a guide for baking. Hope that helps! Just wanted to know if I could use more almond flour instead of the gluten-free blend? How much do you think it will affect the texture. I’m new to your site & really enjoy all the recipes I’ve tried already. Hi Emily, so glad you are enjoying our recipes! We think that using only almond flour would make it too dense and crumbly. Hope that helps! Hi Prue, we haven’t tried it, but that might work! Though it may turn out more dense. If you give it a try, we would love to hear how it goes! I made your banana loaf during the week and it was lovely and moist. I decided to make the Carrot cake in a loaf tin as well and therefore cooked it for 60 minutes at 350f, following the instruction for the banana cake, cooked in a loaf tin, rather than in two tins, but it was quite dry. Now supposing it was because bananas would be more moist than the carrots and so wondering if I should have cooked it for a much shorter time than the banana loaf? That could definitely be the case! I left it out for 5 days is it still okay to eat? We think that might be too long. Hello! I am vegan except that I eat eggs… would adding eggs to this recipe help it at all? If so what would you take away? Thank you – can’t wait to try it! Other readers have had success with using 3 eggs. Hope that helps! Cole, I wanted to reach out and suggest to stop saying vegan…you will most likely get confused and annoyance reactions by misusing the term. Or already have been and maybe you won’t understand why! A vegan would never (ever) use eggs. A better description would be ovo-vegetarian (if you don’t use diary, just eggs). The recipe doesn’t call for eggs. I’ve made this several times and it’s consistently fantastic! I’ve used regular wheat flour multiple times and it still works! I just kind of eyeball the amount to get the right consistency of batter so depending on the type of flour you’re using you may need a little less or more. Using oil other than coconut makes the cake fall apart easier, especially at room temp but it’s still delicious! Sometimes I omit the carrots and add more spices to make it an autumn “spice cake” (nutmeg, cloves, allspice). Recently I made cupcakes with it. I baked them at 350°F for 25-30 minutes (depending on how full the cups are). My favorite frosting with this cake is the vegan cream cheese version she has listed above using toffuti brand (soy based) cream cheese and then adding a little vanilla to it. (The kite hill brand, which is almond based, is too runny. Daiya brand also works well.) One of my non-vegan baker friends says that’s better than her own cream cheese frosting! This same friend has requested this cake multiple times for get togethers and it’s ALWAYS a huge hit, even with other non-vegans!! Highly recommend this cake recipe; it is so versatile and easy to modify. Thanks for working so hard on all your recipes and making our lives easier with them!! Hugs! What is the best alternative to coconut oil in case of an allergy? Hi Grace, a neutral oil (such as avocado oil) would likely work! Hope that helps! Wow wow wow! This is one of the best recipes I have ever made from your blog. I prepared it yesterday for a friends birthday and everyone loved it!!! It was fluffy, moist… amazing. I used normal flour, and didn’t add the maple syrup because I couldn’t find apple sauce without sugar. Also I ran out of almond flour for the 3 batch (I prepared one recipe per layer, big cake! ), so I used hazelnut meal instead. And I topped it with the cashew coconutmilk frosting. The combo was absolutely delish!!! Just wondering if it were that you had a bare cupboard could you use just plain or self raising flour instead and can the maple syrup be substituted by golden syrup?? Hi! We haven’t tried it this way, though we think it could possibly work! If you give it a try, we would love to hear how it goes! WOW!! I just made this cake for the first time and it was absolutely fantastic, and I must say; I’m a real stickler about vegan recipes. I worked in a cake shop for 4 years with top notch quality cake, and I can usually immediately tell when something is gluten free or vegan. 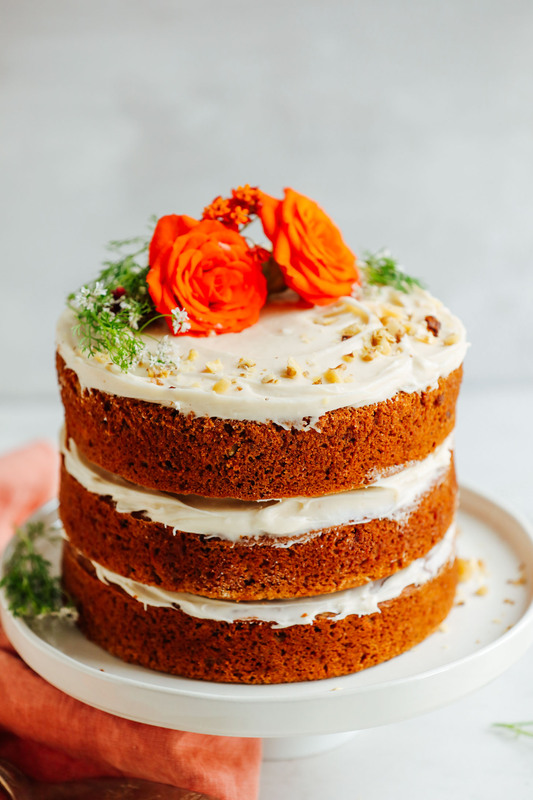 My girlfriend is vegan, and her favorite cake is Carrot Cake, so I found this recipe and hoped that all my non vegan friends would enjoy too. I got comments like “this is the best thing you’ve ever baked” and “this tastes better than any non-vegan carrot cake I’ve had”. And these are college students! Picky ones, at that! I did make a few substitutions: rather than using gluten free flour blend, I used regular flour (I made sure it was vegan). Also, I used the vegan cream cheese frosting posted with the cake, but I made a few subs to this as well: I added a good amount of vanilla extract to taste (I used Kite Hill vegan plain spreadable cream cheese and earth balance vegan butter) and I added some unsweetened almond milk to help smooth out the texture. I also waited for the cake to completely cool, then I wrapped them in plastic wrap and froze them overnight, then thawed the next day and frosted. (I learned this trick in a bakery I worked at, adds lots of moisture). It was just so insanely good, moist, flavorful. I would happily serve this at any party. Try it!! Thank you so much for your lovely review, Kate! We are so glad you and your friends enjoyed the cake! I made this cake and tried it while it was still a bit warm… it had a chemical taste (for which I left a1- star review that I could not find to update or delete) . I gave it another taste later after it cooled completely and it is great. I’m so glad because, like so many MB recipes, they don’t taste GF or vegan! I always know I’ll find something good at MB albeit sometimes a but tedious. Thanks for a great carrot cake recipe… It’s great to be able to make it, enjoy it, and not even notice that it’s vegan and GF. So glad to hear it turned out for you! Thanks for the update! if I change the servings to 24 people and use a 1 9×13 long pan, will the baking time still be the same? or will that even work with a 9×13 long pan to begin with?? A 9×13 pan will work nicely! Baking times should be similar, but it may take a little longer in this case so keep watch! I don’t usually review recipes but was so excited to say that I made the BEST carrot cake ever using this recipe. I am not a baker – too much work, too many measurements, too much fuss; I have had many failures with Gluten Free desserts and I needed to make ingredient changes since I had a surplus of this and a shortage of that. I made my cake, got it in the pans and my carrots were still in the food processor, …. so I took it out of the pans, incorporated my carrots, redid my pans and stuck them in the oven (Sheeesh!) only to discover I had forgotten the oil! Too late, I baked them anyway, not knowing what I’d end up with. Even with all that, my cake is amazing – half will go into the freezer for entertaining and for once, I’ll be proud to serve it. Thank you so much for this great recipe! SO SO SO GOOD! I made this for my grandma’s bday and she was in love with it! Even my grandpa that doesn’t talk that much anymore said “this is wonderful” at least three times haha. I actually made this recipe to compare it to your raw vegan carrot cake that I made for my mom’s bday (I’ll review that too haha) and I made the same revisions to each cake!! On both recipes, I doubled the vanilla and added a 1/4 teaspoon almond extract as well. The almond extract made a WORLD of difference on the raw cake, and a significant difference on this cake. I always need to be obsessed with the taste of the batter before I trust it in cake form, and the almond extract did the trick on both! Also, I like to stay away from vegan “butter” because I don’t think it’s all that real/digestible, so I made your coconut whipped cream frosting for this cake (it was too sweet for me so I doubled the coconut cream to balance it out.) It was also less fluffy than another coconut whipped cream I had made around thanksgiving and I think chilling the bowl actually kept the coconut in “chunks” instead of whipping into a smooth dreamy consistency, if that makes sense? Anyway, great cake! Thank you! It came out perfect, my 3 year old loved it. Followed the exact recipe and the coconut cream frosting was a perfect combination. Will make it many more times. Thanks for the recipe. This recipe is absolutely AMAZING! Those who are not gluten free vegan can’t even tell a difference. I replaced the almond meal with pecan meal due to allergies and if you are using the metric system there will be 455g of batter per 6″ round pans. Happy baking! Whoop! We’re glad to hear that, Samantha! This has become my go-to recipe. It is a total crowd-pleaser. After sharing one cake with family over the holidays, I made a second cake for my immediate family (mostly me) to enjoy. It comes out perfectly every time I make it. I use kite hill cream cheese for the frosting and the non-vegans love it too. Thank you for making such an amazing recipe! Thank you Dana for this amazing recipe! We’re so glad you found this recipe helpful, Katie! I tried very hard to make the calories as harmless as possible and finally got to the vegan, gluten-free 😉 cake! 😋. The result is fantastic, the taste is rich, cream is smooth and tasty, 100% pleasure, both from cooking, and eating! @minimalistbaker – thank you for the great and easy recipe! 😍👍🏻💕 Will definately recommend to everywone! Love this recipe! I replace the almond flour with pecan flour or pecan meal, wither one work just fine. Also, each layer for the three layer cake is 465g per layer. This is good to know when dividing the batter up per pan. I followed the directions to a T, and I could not get mine to bake all the way through. At first, I thought it was done after 50 mins, because the toothpick came out clean no problem, but after I let it cool and cut into it, I realized it was not even close! So then I baked it for DOUBLE the time (another 50 mins) at 350, and still, same result. I ended up cutting them into very thin slices, and baking them at 350 for an additional 20 mins every time I wanted some – but even still the inside was gooey and the outside was burnt to a crisp. What did I do wrong?! This is the fourth time I’m making this cake, so now I gotta leave a comment. I looo looo loo loo loooove this cake! The recipe is perfect as is! Just one little question: do you think it works the same with Zucchini?? I am so thankful I came across this recipe. What a wonderful addition to our holiday meal. I used with almond and oat flour, 1 1/2 C of each, because that is what I had on hand and the consistency and texture was perfect. The cream cheese frosting was the only choice for me as my family loves carrot cake with cream cheese frosting. I opted to make my own cream cheese because I was feeling adventurous and had time. The results were mouth watering and awe inspiring. I had to toot my horn on this one, but don’t worry I gave your website credit for the recipe and for giving me the confidence to try a vegan gluten free dessert the day before our holiday feast. Also made the white bean kale artichoke dip and my non-vegan husband can’t stop raving about it. Thank you for your hardwork testing and perfecting these recipes. I am not a baker, but I promised to make this for my niece’s 50th birthday. Being Gluten intolerant and also on an organic diet, she has not been able to enjoy cakes in forever. WELL! this cake was FANTASTIC AND was thoroughly enjoyed by ALL of us! It does get better everyday, and she enjoyed it so much, so that I’ll be making another for Thanksgiving! I made the cashew butter frosting and it was ABSOLUTELY delicious! Many thanks for these recipes! Also..if using a store bought gluten free flour, do you recommend any brand in particular? I often rely on Bob’s Red Mill, but am uncertain if I should buy the 1:1 gluten free baking or the gluten free all purpose for this recipe. Thank you! Thank you for such a great looking recipe! I can’t wait to add it to the dessert table at Thanksgiving! I am dairy and gluten free, so any of the frosting options work for me. Do you recommend one of these recipes over the others for this cake? I’d love to know your favorite option, so I can copy. :) Thanks! This was my first ever attempt at a carrot cake…and it is amazing!!!! It’s wonderful in texture and just perfectly sweet (not overly sweet). I went with 1/2 cup of raisins and 1/2 cup of walnuts crumbled and it’s perfect. I used the cashew buttercream frosting and totally love it too!!! I used a blend of flours that was about 3/4 gluten free but it’s perfectly clear this will hold together with a 100% gluten free flour blend too. Thank you for a spot on recipe! Yum! We are so glad to hear that, Scott! Hi Dana! I made this cake last year for my son and it was amazing! I’m making it again this week but was thinking of using a 9in bundt cake pan, do you think its a good idea? I don’t want to end up with a tiny bundt cake, lol. Hi! Is it possible to use AP flour (instead of gluten free mix) along with the Almond flour? Or will that change the consistency? Hi Toni! Hi Alex! Yes, that should work! If doing that, use the full amount of almond milk called for. Thank you so much, Dana! I used the almond flour along with AP flour in place of gluten free, and the full amount of almond Milk, and the cake turned out perfectly! Prepared it with the vegan cream cheese frosting. I am not gluten free OR vegan (I made it for a friend who is vegan) and found it delicious! Perfect recipe! Would definitely make it again. I wish I could send you a pict of the finished cake! Hi Dana – Apologies if I’ve missed this in the comments but is it possible to make this as a single pan cake? Many thanks. PS I’m using purple carrots! Hi Malinder! Yes, you can do this cake in 1 9×13-inch pan! Let us know how it goes with purple carrots! 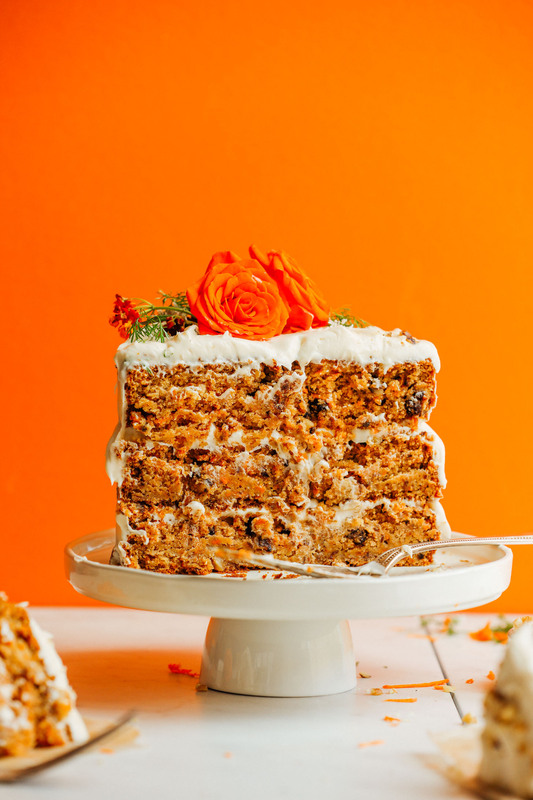 Insanely delicious and juicy carrot cake! I added cinnamon and extra cardamon and made a different icing based on cashew nuts but I’m sure that any of icings provided above would provide extra flavour to the already superb cake recipe! Thanks for this. Yay! We are glad you enjoyed it, Cari! If I’m not mistaken you updated the photos for this recipe . I’ve been trying to find this post & I finally have! I made this before & this carrot cake is amazing! First time commenting (I think), but felt I should since this is the fifth time I’m making this AMAZING cake. This is my go-to birthday cake for me, and now my 6 year old son has asked for it for his birthday too! Last year, for my 40th, I even took all of the ingredients on vacation with me and baked it in our hacienda in Spain. I had a wonderful dinner outdoors, with fried plantains and this cake (with vegan cream cheese icing)! One of my favourite memories! I make it with raisins, but have noticed that some people pick them out (silly raisin-hating-people). I love so many of your recipes, and you make my restricted diet easy and enjoyable. In fact, whenever anyone asks me what I eat (grrrr) I refer them to your blog. Thank you! We are so glad to hear that, Elaine! Than you for sharing! I if I make the cake with whipped coconut cream, is it ok to make it the day before and pop it in the fridge or rather make the cream the next day? I made this cake exactly as written, made the vegan cream cheese frosting with the TJ vegan cheese. I couldn’t find the Earth Balance sticks, so I decided to try it with the tub. The frosting was thin(no sticks) soI put it in the fridge, and waited until the next day to frost the cake. It was so GOOD. My non vegan family loved it. I think I want to add pineapple and coconut next time, just to try. But I would recommend it for anyone. I do wish I’d used 3 6″ pans. Yay! We are glad your family enjoyed it, Michelle! I’ve made this recipe multiple times, and it’s a favorite around here! I did make a few changes that work wonderfully. I usually do a half-batch to only make a dozen cupcakes at a time. Here goes… I use egg replacer (Bob’s red mill) with no problems. I’ve also made with an egg, also no problems. I use a homemade blend for the GF flour (1:1) and no almond flour. No problems when using GF flour for the entire flour portion. I use full fat coconut milk for the milk. No nuts or raisins and a vegan organic store-bought icing. Oh, and I use a homemade baking powder bc I can’t have corn. Thanks for posting an amazing recipe! Looking forward to trying the vanilla cake next! Thanks for sharing your recipe changes, Mellanie! We are so glad you enjoyed it! I made this cake for my mom’s birthday. I halved the sugar and the flavor actually turned out pretty good. The cake itself, though, was dry even though I followed the rest of the recipe to a tee and monitored it while it baked. I also made the vegan cashew frosting which, to my disappointment, tasted like straight-up cashews and not decadent at all. Overall, this cake was OK, but by no means was it stellar. Your recipe was at the top of my instagram feed today and I couldn’t resist making it. I haven’t made a carrot cake since I went vegan 8 years ago because it had so many eggs and so much oil. I was so excited that it was a vegan gluten free one bowl style cake. I also had tons of carrots I could use from my garden. It turned out super moist like you said! There were only two thing I did different. I swapped out the coconut oil for canola and I did use my homemade almond milk. I did do two round 9” pans and had to keep it in the full amount of baking time. I also used your cream cheese frosting recipe and it was perfect! I think the cake was delicious and not super sweet. I wish I could post a picture for you to see. Thank you so much for all the time and energy you put into perfecting these recipes! You make gluten free vegan taste delicious! I am vegan and gluten free, so I have been very excited to see a rise in vegan-gluten free recipes popping up on your site. I’m always eager to give them a try! But sadly, I am not a fan of carrot cake, and with autumn quickly approaching, I’m really in the mood for some pumpkin. Would it be possible to replace the carrot in this recipe with pumpkin (like proper pumpkin, not canned pumpkin)? Hmm, it wouldn’t be a 1:1 switch. Try this recipe instead! SO GOOD! I made this for my brothers birthday party and I received glowing reviews. Thank you so much! luscious! Beautifully moist, lots less clean up, YESSSS! I made it as a bundt and put cream cheese filling! I didn’t have applesauce & had lots of apples; boiled whole and scooped out as pure applesauce! I am wondering if this could be made with shredded apples. I am looking for a Rosh Hashanah recipe and it seems perfect if I could switch just the carrots out for apples. What do you think? Yes, I think that would work. Let us know how it goes! This cake is AMAZING. I was making it for a big party and was super worried about serving a cake I had never made before so I literally made 3 different carrot cakes from 3 different well known bloggers and this one was SO far beyond the other recipes that there was truly no comparison. On top of how good I thought it was…there were 2 chefs at the party and 1 pastry chef who were all begging for the recipe by the end of the night (seriously I was so nervous). So thank you thank you for being so reliable with your recipes and especially for THIS recipe! LOVE. Whoop! Glad to here it, Micaela! Ok, probably a stupid question, but can I just use normal flour if I’m not gluten-free? Yes, you can use all-purpose flour but we’d recommend using the full amount of almond milk called for! I made this today and baked it for 50 minutes as cupcakes and the inside is still batter!! I don’t know what I did wrong!! Help me :( I used coconut flour 1/3 cup and an extra 1/2 cup of GF flour but I don’t know why that would make the cake so moist still. It’s the coconut flour. It is absorbent at first and then goes soggy later. Hi Dana, I love the look of all your recipes..I have just bought your book..it’s Amazing! I was just looking at your wondering carrot cake and would love to have a go at making it. Would you beable to tell me what size pans you use for this cake please. Hi Trish! We’d recommend using either two 8-inch, 1 9×13-inch, or 3 6-inch round pans. Hope this helps! I tried this today for a birthday cake. I subbed some extra gf mix flour and some garbanzo bean/Chana flour for the almond flour, and some crushed pineapple for the apple sauce. I doubled the cinnamon and added a bit of nutmeg, but even so, the flavour was rather bland and didn’t have the nice autumny spice kick I was hoping for. But it was indeed nice and fluffy and moist, so I’ll probably use it again, just with more spices. Double oops! Now I see the carrots. Oops! I don’t see carrots in the ingredient list. it’s right after the almond milk. It’s really hard to find an 8 inch pan how much to increase your receipt? Hi Joseph! You are able to adjust the recipe by changing the serving size at the top of the ingredient list. Hope this helps! My son requested a carrot cake for his 14th birthday. I made a test run of this today, in a 9×13 stone bake dish, for 55 minutes. With your vegan cream cheese frosting. It is DELICIOUS. Thank you! Now all of our birthday guests in August will have something to have for dessert. However, he is asking for cupcakes now (of course, teenage boy ;-) ). Do you have and idea what the cooking time would be for cupcakes with this recipe? Glad to hear you enjoyed the test-cake! cupcakes just bake slightly less time! I swear by your recipes. My all time favorite is your carrot cake. I want to use the recipe to make cupcakes for my daughter who is on the baby led weaning path. So far she’s not into sweets and I don’t want her to get refined sugar just yet. What would you substitute for the sugar in the cake as well as the icing. I don’t want to make more than one batch of cupcakes so that they’re not wasted. I hope you reply to this. I want to make these for her turning 7 months on the 31st this month. Hi! Can this cake be made into cupcakes? If so, how long would you recommend baking? Thanks!! Hi Carla! For cupcakes just bake slightly less time! I made this for my partner’s 40th. Decorated with orange roses too. It was incredible. I’ve made carrot cake before but never vegan and certainly not GF. It was super easy to do, although I used en egg replacer instead of a flax egg (Ener-G I think the brand was). I will definitely be making it again. Thank you so much for posting this. You now have a very grateful and happy follower. Woot woot! Glad you and your partner enjoyed it, Andrew! Hi there…. Im just wondering is there any way to make this with eggs? I know its vegan but what i need is just a gf and dairy free cake, and i havent got the egg substitute on hand. What do you think? How many eggs would make sense? Hi Tamara! You can sub 1 small egg per flax egg! Hi there the recipe says 3 batches flax eggs (3 tablespoons mix) so I would need 3 eggs is that correct? Attempting this for my daughter’s first birthday cake. She cannot have almond flour and almond milk. What’s the best nut-free flour sub and if I use coconut milk, should it be canned or carton (coconut beverage)? I am currently in the middle of making this cake and I don’t what happened but something went horribly wrong!!! I followed this recipe to a T. The only modification I did was using all gluten free flour in stead of part almond flour. I have had these minis in the oven for 30 minuets now and for some reason they won’t bake all the way through! I bit into one thinking it was done and the flavor is great! Clearly I did something wrong. :( so upset because this was supposed to be a great treat for my hubby for his bday tomorrow. Hmm it sounds like the batter was too dense from using all GF flour vs. almond flour, Kayla! We are sorry to hear you didn’t have success with it. If you try it again using almond flour or another nut flour, report back on how it goes! Hi Dana, this looks awesome and I’m definitely going to try it! What size cake pans did you use? I tried looking for the info but I couldn’t find it. 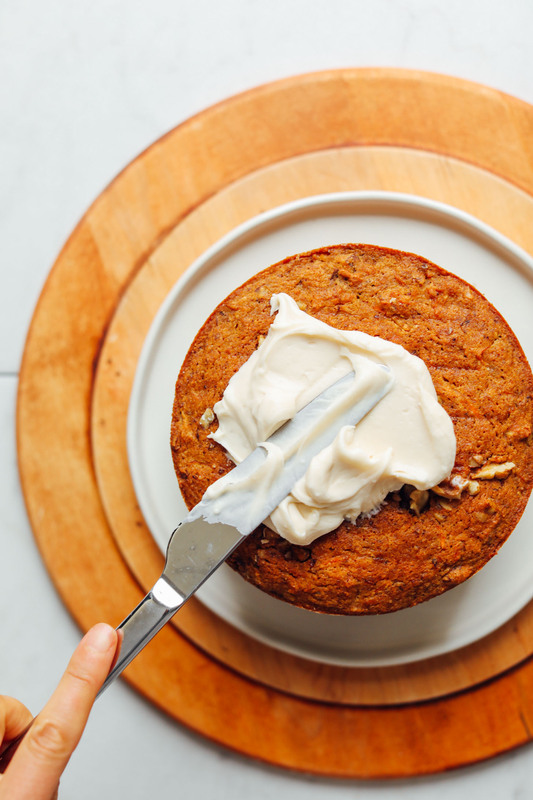 I love carrot cake and this, with cashew buttercream, has become my most favorite recipe!! If I could add a photo I’d show off today’s creation. Thank you!! Hi I have never used flax eggs before. You say one tablespoon of flaxseed would be 7g. I am in the uk and realise American tablespoons are smaller than ours (ours are 15g or ml) but even so 7g seems a small amount for a tablespoon. Can you confirm this for me please? I just want to make sure I am adding enough flax and water! Thank you. Hi Hazel! That should be correct! Made this last night and used the coconut butter recipe as a frosting. It came out delicious, all my non-vegan friends loved it and wanted seconds! I used two 8 inch tins and it raised less than expected, but tastewise, it was perfectly balanced. I used chopped peacan nuts, as I prefer them to walnuts and almond meal instead of almond flour. Thank you for the recipe! I did a make few substitutions though.. I made your cream cheese frosting and added fresh lemon juice to it. If I don’t care about gluten does all-purpose flour work in place of the almond meal and gluten free flour? I made them with regular flour and they were superb! ? Thank you! It turned out wonderful! Also…why almond meal? My daughter is allergic to all nuts can I just substitute the almond meal for extra gluten free flour? Hi Jessica! Try subbing more gluten-free flour blend or oat flour. Hope this helps! Question: Light or dark brown sugar? I hope this recipe will replace my standard version—would be wonderful to have a go-to vegan carrot cake recipe. Looks beautiful and delish! Thank you! I made this cake for a special celebration at work for all non-vegans. They didn’t believe it was vegan until they saw me eating it, too! The co-worker who requested the carrot cake said it was the best he’d ever had – and he considers himself quite a connoisseur. Thanks for the great recipe! Stumbled onto your site while looking for vegan/gluten free birthday cake. My other attempts at deserts haven’t been well received! I followed your recipe exactly and was amazed how good it turned out. Exactly as stated; moist, soft, tasty and with the cream cheese icing – superb. I served it at my daughter’s birthday dinner. She was suspicious that it wasn’t vegan and thought I had run out and found a cake she was so impressed. The biggest complement was that my grandson has lined me up for his birthday cake maker in three weeks! Oh oh what have I done. Thank you. I’ll try some other recipes from your blog. Amazing recipe!! Love your blog. Thank you!! Is it possible to make these into cupcakes? If so how many and how long would I bake it? Yes! For cupcakes just bake slightly less time! Isn’t 9″ cake pan standard?? I like the idea of a orange flower on top. Any suggestions on doing this? This was the best recipe I’ve ever made! It tasted exactly like my mom’s carrot cake recipe sans gluten and dairy! :) I didn’t have any coconut sugar on hand, so I omitted that ingredient completely. I also didn’t use walnuts or raisins because I’m not a big fan of either. I went back for seconds and thirds – it was that good!!!! The best part about this recipe is that I didn’t have to wait too long before tasting the carrot cake because I made them into cupcakes instead ;) Thank you so much for creating this recipe….I will definitely be making this any time another carrot cake craving strikes! Thank you for this recipe!!! Honestly, it was one of the best carrot cakes I’ve ever made. I made this for my health-conscious in-laws at Easter and it got devoured! Instead of GF flour mix, I made my own oat flour and it worked fine. We’re so glad to hear that, Jess! I made this yesterday and the flavour was perfect! I don’t know if I did something wrong, but my cakes were very dense (not fluffy and crumbly like your pictures) but it was still incredible and went over very well with my non-vegan family! Glad you enjoyed it, Christen! Did you happen to change any ingredients? I made this for my family Easter Dinner. I made the cashew “buttercream” frosting. I loved the cake. The frosting was a little tricky for me. I wish I had added more raisins to the cake. I think it would have given it the sweetness I felt was missing. I am new to the Plant based world and still struggle with the sugar removal from the diet. My family did like the cake and didn’t seem to be affected by the sugar cane not being added. It was edible. Made this with Bob’s Red Mill Cup-for-Cup blend instead of Dana’s blend. I am not a regular GF baker but often bake vegan. This was too mushy. I wonder if I needed to bake it longer, as in, as long as possible without burning it. The flavors were good though. :) I might try this again with less liquid/more “flour” and longer cook time. Hi Claire, my thought is that the problem was the cup for cup blend. I haven’t been using it as much lately because I agree, it can give off a mushy, under-baked texture in cakes especially. Hope you’re able to try it with our blend! Ah, I had no idea that mushy cakes with the Cup-for-Cup blend is a known problem. I only do GF baking occasionally, so I figured making my own blend would not be reasonable. But I will make use of the bulk foods section to economically make your blend next time! Sorry for the low-star review, seems that is probably just my own ignorance. Thanks for the guidance! I made this for Easter yesterday to take to my principal’s Easter dinner. I frosted it with your vegan cream cheese frosting. Everyone loved it and it was a dessert that I could eat (I’m dairy-free with a gluten sensitivity)! Thank you so much for all of your fabulous recipes! I made this for Easter dessert yesterday. I made your Vegan Cashew “cream cheese”frosting to go with it. Both were excellent. Since it was my first time making both recipes, I followed them exactly as the recipe instructed, except I used 3 eggs Instead of flax eggs. The cake had a very good flavor, just a little on the dry side. What would you recommend for the next time? Thanks. This recipes was perfect and so delicious. I made it for non vegans ranging from kids to my 82 year old Grandma, loved it! I was a bit worried because I’m new to vegan cooking and baking so i didn’t understand the flax egg and used Bobs Red Hill egg replacement for 3 eggs instead and it worked great. I also made it with the vegan cream cheese icing with 3 cups of powdered sugar, just really good. Your recipes are so great And easy to follow, thanks so much! Hi, I’ve made this recipe but I got a very oily and gooey inside. I subbed almond milk with coconut milk (full fat). Could this have made an impact on the outcome? Thanks ! Yeah, that is too heavy. Next time, use light coconut milk and you should have better success! Hello! Can I just use all-purpose flour? Thanks! Yes! If you are not using the GF blend then add the full amount of almond milk! I want to make these as cupcakes. Do you think I could just use the same recipe and put in muffin tin? Just cook for less time? For cupcakes just bake slightly less time! Just made this and it is the most delicious, perfect carrot cake!!! I am not gluten free so I used regular white flour and also subbed grapeseed oil for coconut oil and it is absolutely perfect. Also made your cream cheese icing (using tofutti) and it is delicious. It really is the perfect complement to this wonderful cake. 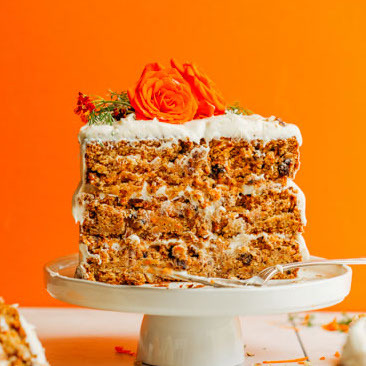 My husband has never liked carrot cake or cream cheese (vegan or not) and yet he loved this! Thank you for such an amazing recipe. How long do I bake these for cupcakes and what temp?? Hi Liz! For cupcakes just bake slightly less time! Hey there! Wanted to make this for Easter. Will it still be delicious if I make it Saturday and serve it Sunday afternoon or should I make the same day I’m serving it? Hi Alexandra! Feel free to experiment with other sweeteners or cutting back the sugar. You can substitute other sweeteners of choice. Just know that if using a wet sweetener, it may thin the batter. And if dry, they may thicken the batter. My primary suggestions would be stevia, more brown sugar, or honey if not vegan. I made them! Used less (close to no) almond milk because I knew the dough would be too wet without the sugar. Turned out amazing!! Love this (and all your other) recipes!! Make another cook book! Can you make this into cupcakes? Just change the baking time? Could I sub crushed pineapple for the applesauce? Can this be made with just regular all purpose flour and have the same consistency? I don’t need or use the other flours, so don’t have them on hand, but would love to make this cake. Yes, that should work! If doing that, use the full amount of almond milk called for. Hi Lori! We haven’t tried making this cake in a bundt pan, but just keep in mind that the cake will need to bake for considerably longer (the cake is done when a skewer inserted into the center comes out with no crumbs attached) Also, resist the urge to pull it out immediately and give it time to rest — a good 10 minutes usually does the trick! I used to 8 inch cake pans and the cakes where both pretty flat, did not rise that much. It tastes delicious, but the cakes didnt rise much and looked pretty sad as a layer cake. Did I do something wrong, or is it better to use the smaller cake pans for a fluffier, taller cake? Hi Alexandra! It doesn’t rise a ton but using three smaller (6-inch) pans makes it fluffier and taller and a more beautiful presentation. Hope this helps! is coconut oil necessary for this cake to work?? Just wondering if i could sub for water or less oil, because i prefer to consume very minimal amounts of oil in my diet!! Hi Ruthie, we do recommend using some type of oil. Whether you want to use coconut oil or another oil, it is pretty key to the recipe. Hope this helps! If you were to add raisins to this, how much would you recommend? So after following this recipe to a T it’s unbelievably crumbly and not even remotely cake batter. I’ve added twice the required almond milk and the batter is still crazy dry and one big lump of not cake batter. Any thoughts? Hi! Do I have to make it three layers or can I make it just two layers? Is there any reason why I couldn’t do that? I’m very new to baking, so please advise! Thank you in advance! Hi Kelli! If you’d prefer making a two-layer cake, you can do that! Wow, this looks incredible!! Definitely going to give it a try! If I were to make cupcakes instead of a full cake, would there be any modifications? Thanks! Hi, I love your recipes! Our family avoids saturated fats, especially coconut oil with its 12g per TBSP. I saw your not on substituting applesauce and how it might affect the texture. How about avocados and/or a mix of avocado and applesauce? Do you have a suggestion on amount to use of avocados alone or a mix with applesauce for better texture? Thanks! Made this cake tonight in 2-9inch pans. Cooked 40 minutes but was hard to tell if it was cooked all the way through. Was not fully cooked when we dived in, would recomend longer time if your on the edge if its cooked enough. Hi Ely! I am sorry to hear you didn’t have success. Did you change the recipe at all? Also, what did you cook it in (pan type) Let us know and we’ll do our best to help solve this! We used and already made gluten free flour, and we cooked it in 2 pan with heart shapes the right size! Delish! My husbands favorite is carrot cake and he loved it! I followed someone’s suggestion and also subbed the gluten free flour with the same amount of all purpose flour, and it worked just fine. I used the cashew cream cheese version and added 2 tablespoons of lemon juice and a little bit of extra maple syrup and vanilla and it came out great! Thanks for the amazing recipe! Will be making again soon! Do you think these would work as cupcakes? Awesome recipe, I used it to make 24 cupcakes and they turned out great! Added raisins and lots of chopped walnuts. Yummy! Thank you for creating it. What can I substitute the almond flour for? Hi Shaz! Another nut/seed flour (such as hazelnut, sunflower seed, or brazil nut) will work. If you can’t tolerate nuts or seeds, try subbing more gluten-free flour blend or oat flour. Hope this helps! I substituted pecan meal for the almond meal. I just ground them up in the coffee grinder for about 8 seconds, and did it until I had the 1/1/2 cups. I can’t have almonds either. I also substituted So Delicious plain coconut milk for the milk. It needed to be cooked a little over 1 hour. It turned out well and was delicious! SO good! I added both walnuts and raisins to this delicious moist cake and it truly hit the spot. My dinner guests were impressed that this was both vegan and gluten free. I highly recommend the vegan cream cheese frosting. Hands down best Carrot Cake I’ve ever made or eaten ! I usually bake with non vegan ingredients, but I have been really trying to cut down on both animal products and gluten . This cake really hit the spot , my family had no idea it was gluten free and vegan . Modifications I made include using mashed banana and a 1/4 cup more coconut oil in place of the applesauce , since I was completely out . This substitution worked fine for me . I also used almond meal flour instead of almond baking flour and it worked just fine . Thank you again for this amazing recipe! My vegan buttercream frosting was very thin, what do u suggest? Hi Tray! May I ask which frosting recipe you followed so I can get a better idea? Thanks! The vegan buttercream in this recipe : 1-BOWL VEGAN FUNFETTI CUPCAKES. Hi there! I’m wondering how can I replace the maple syrup (I think that honey is the easy way) and the applesauce in this recipe and others…I’m from Argentina and this two ingredients does not exist here so it would be great to know what can I use instead. Thanks in advanced! you can replace the apple sauce using crushed pineapple (that is what I did). Just blend some pieces or pineapple – it goes well with the carrot cake. Added some more spices to it ( cloves, nutmeg, ginger and cardamom). Thanks si much for your reply Natalia!! Wow! Absolutely amazing. Thank you so much for sharing. Great recipe: I made it for my birthday yesterday: It was scrummy and it tasted even better today. Could this work with Bob’s Red Mill GF 1:1 Baking Flour? I looked through the questions and if I missed it and someone already asked then I apologize :-). I would like to make these into GF Vegan carrot cake cupcakes. Should I just follow the recipe as is? Also can I just use the AP GF flour and not use the almond flour at all (substitute the GF for the almond). Hi Deena! Bake the cupcakes at the same temperature called for in the cake recipe, but reduce the baking time by one-third to one-half (cupcakes usually bake for 15-20 minutes). Check doneness by inserting a wooden toothpick into the center of the cupcake. If the toothpick comes out clean, the cupcakes are done. Hope this helps! Super Yummy! Make sure you let it cool fully before eating!! We got excited and tried to eat it 10 minutes after it came out of the oven and it was a little gooey, but once it cools it’s great. I just made 3 of these ….2 for xmas and one for a friend for her birthday!!! I made it the 1st time a month ago and everyone loved it. I substituted mashed banana for applesauce because we didn’t have any applesauce in the house… it made the cake banana-y but it was still very good! I also used almond meal instead of almond flour, which gave it a bit more chew but it was still a light and airy cake. A layer of coconut butter in the middle was perfect. Great recipe! Gonna try it again with applesauce this time! Thanks for sharing your subs, Kirsten! Love this recipe. 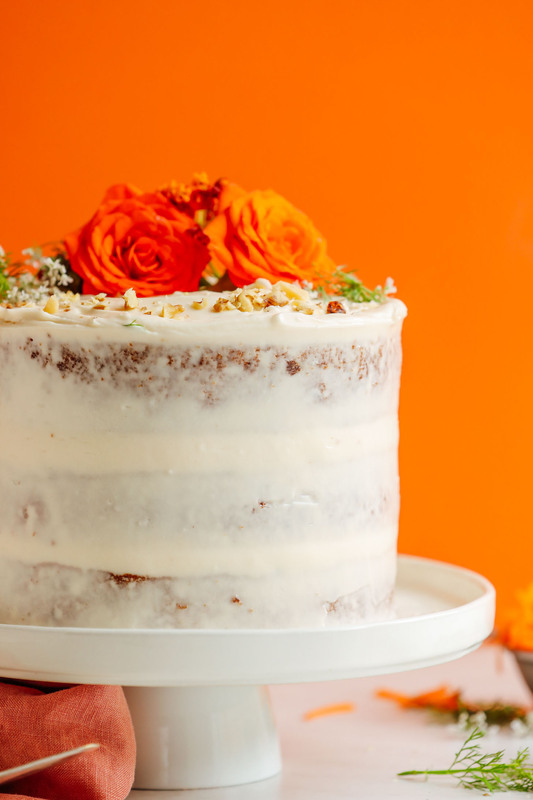 I’m planning to make this lovely carrot cake again for a party this weekend. The first time, I used the vegan cream cheese frosting. I made it with vegan butter spread; it was very loose. I have vegan butter sticks this time, and I’m excited to see how the frosting goes! I love all of your recipes and your cookbook. Thank you for existing and sharing your knowledge! I made this cake with regular white flour but everything else remained the same with the exception of adding ground cloves… Ok, so I also got vegan cream cheese and mixed it with a vegan vanilla frosting. It was delicious! I brought to a family gathering and my family of meat and dairy eaters loved it! My mom said she could not believe it was vegan. I made this cake for my vegan sons 15th birthday…he just loved it and said that it was the best gift I could have give him!! Also everybody at the party was non-vegan and they just loved it!! This looks great! Planning to make it for my friends birthday, but how would I substitute all purpose flour? We are not gluten free and have plenty of AP flour on hand! Hi Taylor! Yes, that should work! If doing that, use the full amount of almond milk called for! Dana -I baked this carrot cake for my wife’s birthday today. It turned out really really good. Thank you!! I made this cake last night (my first from your site). I used two 9″ cake pans and was concerned that it didn’t have a high rise to it, not like what I used to get from “box mixes”. I didn’t let what appeared to be a problem stop me. I pressed on and I was pleasantly surprised at the end result. While making the cream cheese frosting I kept tasting along the way for sweetness and watching the change in texture as I continued. I added the walnuts and I loved the end result of the cake. My daughter and son in law loved it too. Thanks! I look forward to trying many more of your posts. I’m sincerely impressed. I imagine this recipe would work with regular flour? I don’t care about being gluten free, but I live in Denver and don’t want to mess with the recipe too much because of the elevation. Thanks! I love your site… I get most of my recipes from you! I made this just now and it’s cooling as we speak… however… my cakes turned out super thin compared to your picture :( I used 2 9×9 pans as that’s what I had on hand and my cakes are maybe 1/2” thick? Maybe 3/4”. Is this normal? Hi, is there a way I can use cassava, tigernut, coconut, and arrowroot flour (instead of the mentioned flours above)? If so, what are the ideal ratios? Hi, do you know if I can make this into cupcakes? Hi! Yes you can! Just bake slightly less time! This looks so promising and delicious! Will it work if I cut down the ingredients by half to make a smaller cake? Hi Claire! I would follow this! Hope it helps! I made this and though it turned out super tasty, the outside of the cake turned out tough whilst the inside remained deliciously moist. I had to use arrowroot flour and oat flour (all I had on hand). Does that explain the difference in consistency? Hi Shannon! Yes most likely, better luck next time! Hi Alex! Yes, that should work! If doing that, use the full amount of almond milk called for! First time making vegan gluten free cake and I am seriously suprised at how good this turned out! Thank you so much for doing all the hard work and sharing this recipe. I used the Now Gluten Free flour which has similar ingredietns to your blend and I used pecans instead of walnuts and cashew milk instead of almonds as I’m intolerent to almonds. I made the cashew buttercream recipe you suggested and it’s so divine! Only thing is I need to double the cake mix as the cake does not rise as much as conventional cakes and I only managed to get 2 x 1inch layers and for a bigger cake I would need at least 3 layers. Fabulous recipe though. Thank you. Did you just sub the gf flour 1:1 for almond flour? I made this three times already. It’s incredible. The last time I doubled the recipe because I already knew how good it is and that people would eat the whole thing! I made this using the exact half of the ingredients and it was a great success! I baked them using a muffin pan and made 12 muffins. I also used thick soya yogurt with maple syrup. Each one is around 200 calorie, packed with a lot of nutritious stuff! Delicious, thank you very much. What is the best store bought gluten free flour substitute to use for these? Also, can they be made into muffins? Hi Sarah! We like using this kind! They can be made into muffins, just bake for less time! Thank you! I did a test run today with mini and regular cupcakes. I thought they were done but ended up being mushy inside. I still cooked for almost the same recommended time as the cakes. Could it be because I used silicone muffin pans? I’m going to try again next week and will cook longer. I’m getting ready to bake my first tiered cake EVER and I want it to be this one! I can’t consume starchy flours like tapioca / white rice / etc. Is there an alternative I could use for the cup and a half? Oat flour? Or more almond flour? Mine came out flat. I baked it for 40 minutes, couldn’t tell if that was enough, a knife came out clean. Tastes great but has a dense, pudding-like texture, not fluffy. We’ll eat it anyway. Hope my guests like it. I would like to make this cake for my daughters first birthday but I would like to use dates as a substitute for cane/coconut sugars. What ratio would you suggest or would you suggest something else? Hi Joanna! Date puree can substitute 1 cup of sugar in any recipe. Puree 1 cup pitted dates with 1/2 – 1 cup hot water until a thick paste is made. Hope this helps! Thank you so much for your response! I’d also like to ask if I could make 12 cupcakes using this recipe, is that possible and how long would I bake them for and at what temp? Hi Joanna! It should make 12 cupcakes, and keep the same temperature for baking just bake for slightly less time. You may need to keep an eye on them just to make sure, they will be ready when a toothpick comes out clean! I made this cake, and many of your other recipes they are all so yummy and look so beautiful. I love how you keep the ingredients list simple, short, always healthy, and vegan. This is my favorite place to look for any recipe for any meal love it. Hi, I made this cake and I followed the recipe exactly but it didn’t work for me:( It was completely flat, almost like a pancake, and it was raw inside but burned outside and I had to keep it in the oven 20 minutes more than the recipe calls for. I don’t think it’s the recipe, but I just don’t know what I’m doing wrong! I want to try to make it again…any ideas what might be the problem? Greeting from Finland! Made this previously and non-vegans and vegans loved it all the same! Now baking it for Indian- themed birthday so I added some cardamom to the dough and will add some coconut in frosting. Best carrot cake ever although I didn´t make it GF. Made this for my daughters 9th birthday! It was absolutely the best cake I’ve ever had. Followed the recipe exactly. This will be my go to cake! Thank you so much! Girlll you’ve done it again! I made this using your homemade gluten free flour blend and it was SO good. I should have cooked it a little longer, as you suggested, but it was so moist and cake-y and amazing. I made it with your “cream cheese” cashew buttercream. To die for. Will make it again and again and again. Thank you!!! I made this for a friend’s wedding 2 weeks ago and then again last week as it was so delicious! It’s dead easy to make and just the perfect texture and sweetness. It’s just unbelievable that it’s completely vegan. I surprised my husband with this cake for an early birthday celebration over the weekend and it was the BOMB DOT COM!!! 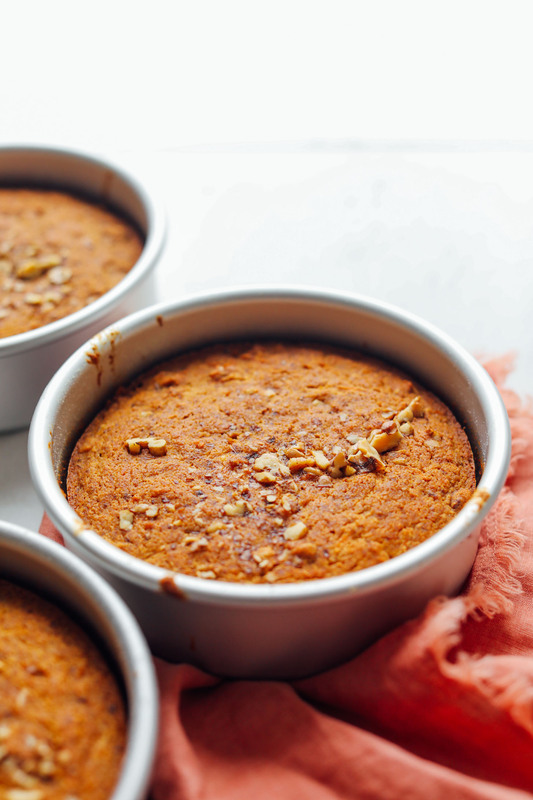 Carrot cake is one of his favorites and with us wanting to move to more of a vegan/vegetarian lifestyle, I was determined to find a healthier recipe. This was a hit with the hubby and he was blown away by how good it tasted! And I have family who had it and couldn’t even tell it was vegan. I made the buttercream frosting with it and that was absolutely delicious too! I’ll definitely make this again and again because I couldn’t believe how yummy it was!! Dana, THANK YOU for sharing this wonderful recipe!! Thank you, Dana! This is perfect for my birthay. Hope you had a great one! This was very good! Great texture. I made this and after letting cool in pans 15 minutes I wrapped the still warm cakes with Saran Wrap and put into ziplock and froze. Defrosted two days later with excellent results! Next time, I will increase the cinnamon to 2 t., increase salt to 1 t., add 3/4 t. ground nutmeg, and add 1-2 t. vanilla. I feel like when gf items get baked, the spices fade into the background. I made a lemon buttercream: 4 T. Earth Balance stick, room temperature, 1/4 t. salt, zest of one lemon, juice of one lemon (3T. ), 1 t. Vanilla, 3 3/4 C. powdered sugar. Baked the cake for my husband’s birthday. The cake was a big hit and very delicious. Thank you for your hard work on Gluten Free recipes. I intend to use your recipes in the future. Our family is a real challenge to feed one dish between gluten issues, nut, soy and milk allergies your recipes will restore my sanity. Thank you again. I made this as a cake and it was A—mazing!!! Are there any adjustments needed if I want to make cupcakes out of this recipe? Hi! For cupcakes just bake for slightly less time! I made this for my non-gf husband’s birthday and it was a big hit! I haven’t baked much since my autoimmune diagnosis, but this was very encouraging (I used to bake weekly). I used 3 eggs instead of flax, since I’m not vegan and I do have to avoid flax. The cake rose wonderfully in two 8″ pans. I let the cakes cool in the pans for a good 4 hours (b/c of schedule), and they turned out with a perfect crumb. I added some ginger and black pepper along with the cinnamon. The cashew “cream cheese” frosting is delightful when paired with this! Thank you! My husband made this for me for my birthday and it was out-of-this-world good. Moist, flavorful and delicious. He used the cashew “cream cheese” frosting, which was perfect, because it wasn’t too sweet, and it was a hit with the whole family, none of whom are gluten free or vegan. I just polished off the last piece and I’m seriously considering making another cake tonight! I just made this. It tastes delicious however it falls apart really easily. I followed the recipe as written. Any advice? Hi – could you tell me a good substitute gf flour for your gluten free flour blend? e.g. gf plain flour, gf self raising flour etc that can be shop bought? I can’t get hold of tapioca flour anywhere but am very keen to try this recipe! I made this for my twins birthday and it was a hit. I love the cashew butter cream. This was DELICIOUS! Brought it to a birthday party of all non-vegans and they went crazy over it. I did add a splash of vanilla extract into the frosting for a better taste and it was PERFECT! Happy Belated Birthday ??? I know am very late but hope you had a fabulous day!! Love your recipes ~ thank you for all of them!! I am type 1 diabetic and would not want to add the sugar to this recipe. Coconut sugar is still sugar and does have the same effect on blood glucose levels. Do you have an alternative to the sugar to add sweetness? What could you use instead of applesauce!? I see a ton of recipes these days that use it and I’m allergic to apples ? Help a girl out! Hi! Mashed banana or pumpkin puree! I followed your lead and made this for my birthday too! It was very moist and flavourful. My modifications include using real eggs, all coconut sugar and honey sweetened apple rhubarb butter instead of apple sauce. I only needed the 3/4 cup almond milk. I also put all the batter into one 9 inch pan which was a bit too much (some overflowed) but it turned out great. Frosted with your cashew buttercream icing. So delicious and popular everyone wanted more but there wasn’t anymore! Served 16 poeple. I was thinking of doing muffins next time! Thanks Dana!! How many eggs did you use Beautiful One? Thanks! Three! Good luck! Also it did make muffins/cupcakes marvellously. Thank you, Erin! Much Love! How many cupcakes will this recipe make? I just want to make a half a dozen. Also, what can the applesauce be subbed for? I baked this cake again, this time with 1/2 cup apple sauce and 1/2 cup almond milk, and again using only almond flour (3 cups). It was a little less moist but unfortunately still broke when taking out of pans. From this experience I would have to advise not to use only almond flour in this recipe. It simply isn’t firm enough. I’m going out to buy the ingredients for the gf flour asap, I’m certain it will come out perfect then. I made the cream cheese frosting and that as well as the cake was still super delicious. Thanks again! I want to make this cake but don’t have the gluten free ingredients at home now. Can I make this using regular gluten flour? waited about 20 min before taking them out from the pan and it fell out in pieces. I’m trying to figure out why it didn’t come out right. I followed the instructions meticulously except I only used almond flour since I didn’t have the ingredients for your gf mix, I only used 3/4 cup almond milk, and I added 1/2 cup of raisins. I used less than a cup of the apple sauce as well. I also noticed that the tops of the cakes had caved in and as soon as I touched it, it sunk in. So bummed. sure what I should change. Less milk? Less applesauce? Or maybe I should buy a different gf flour besides the almond? Any help is appreciated, and THANK YOU for such a delicious recipe! Almond flour is very moist so you can’t just sub it 100% for a gluten free flour mix, I would bet that is why the cake fell apart. I follow primarily for the dairy free aspect so I used half cake flour half All purpose flour and two eggs…this cake was delicious! I Made it to test for my little ones smash cake for his October birthday and it will be perfect! Our whole family loved it! Wonderful recipe! I used my kitchen scale and meticulously followed the recipe, used two 8″ pans and took them out when the top looked golden and pulled away from the sides, and a toothpick came out with crumbs, let it cool for a few hours with air flow, yet it was mushy and very disappointing. I wonder what could’ve gone wrong? I also tried the cashew icing and it wasn’t sweet enough to taste like icing (though I was impressed with its appearance and consistency once cooled and whipped!). Combined it was unfortunately a flop of a birthday cake. I’ve enjoyed many of your recipes and have been baking for years, so confusing that it flopped! Hi, what is the difference between almond meal and almond flour? and can I make almond flour at home or do I have to buy it? Hi! They are basically the same thing, almond flour is often much more finely ground than almond meal is and has a more uniform consistency. Also Almond meal can be blanched (skins removed) or unblanched, while most products labeled almond flour are blanched. As for making it, all you do is blend almonds in your blender, or you can buy it! Hope this helps! such a great recipe, thank you for sharing! tasted even better on day 2 ! I made this the other day and it was absolutely delicious! Everyone in the family loved it! I followed the recipe exactly, except for adding some raisins and flaked coconut in addition to the walnuts. With a husband who has to eat gluten- and dairy-free, and three of us who are vegan by choice, your recipes are an absolute godsend. Thank you, and keep the recipes coming!